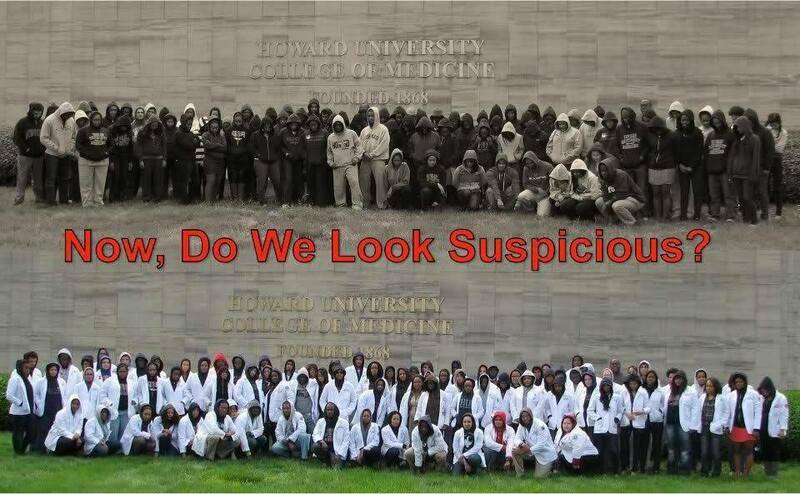 I cribbed this picture of Howard University med school students from the internet. I’m upset about the whole tragedy swirling around the death of that kid in Florida, Trayvon Martin, and the acquittal of his killer. I think everyone is upset about it, even people who feel that justice was served. Here’s who I keep thinking about. My doctor. No, not that one, although this does seem like one of those fixed pivotal points in our culture. My other doctor, the one who sang Happy Birthday to me on what we all thought would be my last one. The one who was the principal investigator on the study that discovered the cure for my cancer. My Doctor. He’s my favorite person in the entire world who is not married to me or related by blood. I just keep thinking, What if it had been my beloved doctor who went for a walk in the Florida rain that fateful night? I picture him with a bullet in his chest, dying in pain on the ground in the mud. On the surface, there isn’t much of a difference between My Doctor and Trayvon Martin, if all you see is a black guy walking. It would have been a terrible tragedy, a great man — a good man — taken from this world too soon. Also, I’d be dead. I’m a bit loth to even write about it, and here’s why. Anyone who knows anything about breast cancer research and has followed my case knows immediately who my doctor is, now. I feel that I might have stomped all over his privacy to write about how I feel about him. It’s not my story to tell — but there you go. I told it anyway. The next time you see a black man walking around, or hear about a black man walking around, or picture in your mind the image of a black man walking around, I hope the image of my wonderful doctor is the first one to pop into your head. There goes a guy who saves lives for a living, is what I hope you think. Why not? He could be. One of my favorite comments about the whole mess was that it was okay to stand your ground if you’re white and have a gun but not if you’re black and use your fists. The disconnect there points out the absurdity of this law and the whole trial.